Nippon Professional Baseball’s revised collision-prevention guidelines will be put into effect this week, the commissioner’s office announced Wednesday. Starting on Friday, runners will be called out if they clearly initiate contact with fielders while trying to score, while runners whose path to home base is clearly obstructed by a fielder will be ruled safe. Players violating the guidelines will receive warnings, even if no collision results. Under the original interpretation of the guidelines that went into effect this season, a number of out calls at home plate were overturned on video review due to technicalities. In most cases, the fielders had allowed the base runner a clear path to home base but were found guilty of having a foot on the third base line — in violation of the guidelines. After teams filed official complaints about overzealous and arbitrary enforcement, NPB began looking for a more practical approach to the problem. The new standards were expected to go into effect on Monday, but their introduction was delayed by a union request that players be briefed first. The anti-collision guidelines were introduced this season to decrease the number of injuries at home plate — where NPB has traditionally ignored its rule 6.01(i) that prevents fielders at every base from occupying the baseline without the ball. 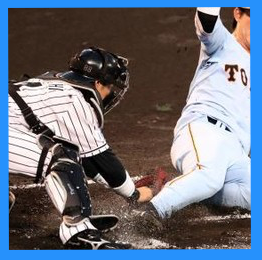 Because this rule is not enforced, catchers in Japan have traditionally been expected to obstruct the base line and block home plate before the ball arrives. In turn, runners had been allowed to crash into fielders at home plate in an effort to score — by dislodging the ball and knocking a catcher unconscious if necessary.